For a fourth month running, the growth in new jobs came from the private sector. Government layoffs, meanwhile, have been a solid feature since the Feb. 2010 trough, which followed a big boom. Wait until Uncle Sam actually, and inevitably, is forced to tighten the fiscal belt. U.S. nonfarm employment increased by 80,000 on a seasonally adjusted basis in June, according to a July 6 report from the Bureau of Labor Statistics, and the unemployment rate stayed steady at 8.2 percent. Job gains in April were revised downward by 9,000 and those in May were revised upward by 8,000. 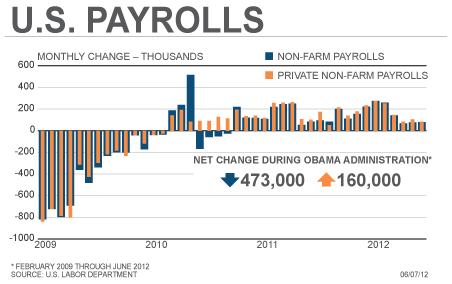 Nonfarm payroll employment bottomed in February 2010 at 129.2 million. Since then total employment has risen by 3.8 million, private employment has risen by 4.2 million, and government employment has declined by 528,000 (federal down 65,000, state down 86,000 and local down 377,000.) From the peak in June 2007 to the trough in February 2010, total employment declined by 8.4 million while government employment rose by 264,000. Government employment has declined by 50,000 since December 2011 while private employment has increased by 1 million.